Well-chosen modern storage solutions improve both the look of a space as well as your peace of mind. By organizing chaotic clutter and putting it in its place, shelves and cabinets streamline modern spaces and focus attention only on the decor desired. Contemporary shelving also adds to such decor with distinctive modern style. Whether it's open shelving or closed cabinets, portable or fixed, on the floor or wall, for organization or display, you're sure to find the modern storage you need here. 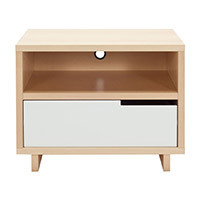 The beauty of modern storage furniture is that you can really use it anywhere in the home. Supplement existing cabinetry and available work surfaces in the kitchen or bathroom with the array of wheeled cabinets and trolleys. 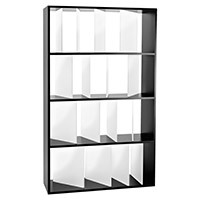 Organize and display your books and other miscellaneous items in the living room, home office or bedroom with wall-mounted shelves and full bookcases. Buffets and sideboards naturally find their home in the dining room where they can establish an elegant and noticeable presence during dining and entertaining occasions. 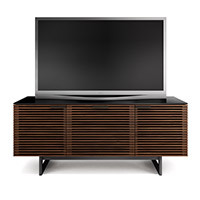 A media cabinet creates a home for electronics and accessories in the living room and look to a well-designed filing cabinet to properly store any loose papers in the office. Finally, keep your bedroom organized with a credenza or clothing dresser, and be sure to see the selection of bedside tables to keep your essentials stored nearby. With the right mix of storage and shelving in your home, you'll have a well-dressed and well-organized living space you can enjoy. Every space benefits from the addition of contemporary furniture to help keep things organized. And whether your home follows a traditional aesthetic or is filled with modern lighting and decor, these storage options are guaranteed to be appreciated. 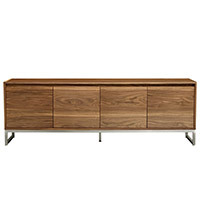 Clean lines and fine Italian design come together in the assortment of storage furniture from Calligaris. From bedroom dressers to wall shelving, Calligaris offers an eye-catching solution to any of your organizing needs. Copeland Furniture accomplishes a traditional wood furniture aesthetic with a large variety of buffet tables, clothing dressers, cabinets and nightstands to fully furnish your home. 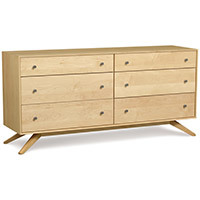 Made with wood sourced from the forests of Vermont, the line from Copeland is sure to meet your design needs. 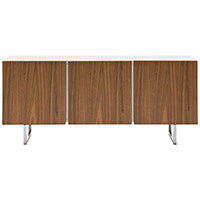 Consider a mid-century theme with Gus Modern storage and organizing furniture or vintage options from IonDesign and Jonathan Adler. Lastly, round out the look with unique and radiantly colorful designs from Kartell. 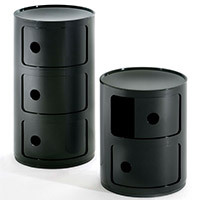 Kartell's use of color and hardy plastic material makes its furniture line a perfect fit for any home. When shopping for new shelves, bookcases and any other kind of storage furniture, you will want to properly measure your room before you even start looking through all of the available options. You will also want to have a thorough understanding of the product's dimensions, including its height, depth, width and weight. Without understanding these dimensions, you could end up with a design that does not fit well in your space. Once you have a size in mind, select colors and finishes that most appropriately blend in with your home's existing decor. You may also want to choose your shelving and storage furniture by its specific features, like how may clean it, where it can be stored when not in use, etc. If you have any questions about the shelving and storage featured here, please call our furniture experts at 877.445.4486. 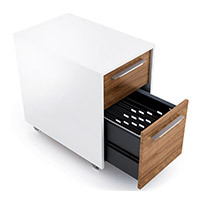 If you like these contemporary storage solutions, then continue on in your quest to organize with the selection of office furniture and the wide assortment of home organizing accessories available. The furniture you choose for your home office lends itself to your productivity and each organizing accessory serves a fundamental purpose of finding a place for everything and everything in its place. And turn your shelving unit into a functional light fixture by outfitting it with one of the available clamp lamps. A clamp or shelf light simply attaches to the unit and is portable anytime you choose to redecorate. Lastly, if it's storage for the deck or patio you need, you'll find it in the selection of outdoor furniture.